Stone Painting for Kids: Designs to Spark Your Creativity by F. Sehnaz Bac has arrived. I had my book on preorder on Amazon so I could get a copy as soon as it was published. I’m a big fan of her original book The Art of Stone Painting: 30 Designs to Spark Your Creativity. I couldn’t wait to tell you about it. Rock painting is a fun addicting hobby for both adults and children. This book will help kids learn how to create amazing vibrant designs with step-by-step instructions. The kindness movement was started somewhere in the Pacific Northwest. Someone started painting rocks, sealed them and then left them outdoors for others to find. When you found the rock, you were instructed to go to a Facebook page and take a picture of the rock to let the club know that you found one. Once you find one of these special rocks, you can’t help but want to join in all the fun. I love this movement so much I started a group on Facebook called Rock Painting Ideas and Resources and it has grown to over 19,000 members. I would love to have you join and share your works of art. You can join the group here. What’s so special about these groups, is that they go out of their way to spread joy in others lives. When they find out that kids with special needs are going to be playing in a certain area, the rock angels “hide” plenty of rocks for the kids to find. A children’s hospital in Seattle lets everyone “hide” rocks in the hospital for the patients. Seniors who felt like they were no longer needed are hard at work painting rocks to spread the mission even farther. Children love to create works of art, knowing they’re going to brighten someone’s day when they hide the rock to be found. This movement teaches kids to tap into their creative side and to do something nice for others. This book is a must-buy in my opinion. It’s the perfect way for children to improve their art skills and have fun doing it at the same time. 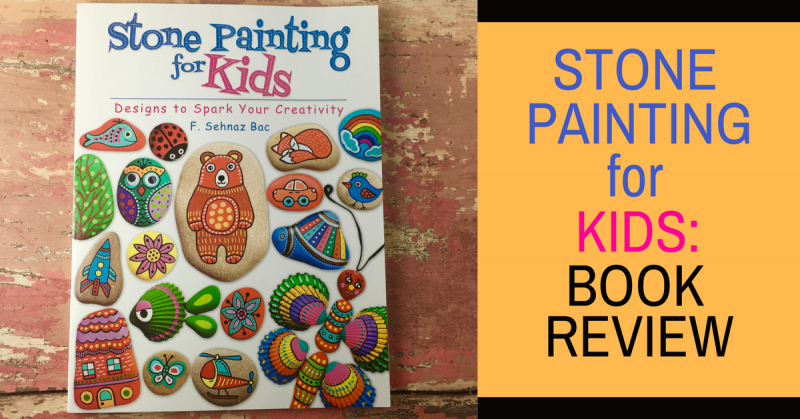 Not only will kids love this book, but adults just getting started painting rocks will love how simple the instructions are. The first part of the book shows how to create different geometric shapes and add some lines and dots to jazz them up. The entire alphabet is created on different stones and numbers 1- 10. For numbers she shows how to do them free-hand and with stencils. Ten different heart designs were created and four of them were shown how to do them step-by-step. This is a fun one – several different faces were made. Various shaped eyes, noses and hair are all shown how to create different looks for each stone. Flowers are one of the favorite things for rock painters to paint. Flowers were created with multiple stones, with each rock being a petal. She also shows how to make a single flower on each rock. There are a couple examples on the cover of the flowers. Toadstool mushrooms are adorable with their bright red caps and polka dots. An entire set of dominoes was made. Imagine how much fun the kids will have making their own set and then playing with their creation? One of the adorable shellfish is featured on the cover of the book. They are such cute idea and easy for the kids to make. This was a fun idea, creating chess pieces so children can play chess with their own art. Who wouldn’t love a pink bunny rabbit? Eight stones were used to make up parts of the bunny. Two ears, the head, body, and four paws. Pebbles with words are the perfect stones to use in the kindness movement. She shows different backgrounds and designs. I love the fun house ideas she used. She takes three different houses and then shows how to make them in four different steps. One of the houses is featured on the cover. This isn’t an ordinary butterfly. Her shell butterfly is beautifully vibrant and is made with both shells and stones. Planes, trains, trucks, cars and boats all make a splash on the pages. What child wouldn’t love to make their own train set, complete with a caboose? Saturn, sun, moon, stars, clouds, rainbow and lightening each have their own rock to display their beauty. You are show how to paint a bear, cat, puppy face, paw print and snake in four different steps. Playing tic-tac-toe just got more fun when you use your own artwork. These are just some of the ideas she features in her book, there’s even more ideas that I haven’t listed. Make sure you’re able to remove stones from where you find them. Removing stones from National and state parks isn’t okay. Removing rocks from waterways can also be against the rules. It’s also illegal to take rocks from railroad tracks. If you live in an area that it’s hard to find rocks, head over to your nearest home improvement center, landscape supply store and garden centers to purchase some. I found landscape rocks on Amazon – you can find them here: 20 pound bag of 3-5″ rocks. You can find them here. If there is any light bumps or grit on your rock, you can sand using 150 grit sandpaper. You can find it here. Use acrylic patio paint for best results if you will be hiding your rocks outside. Adding a white layer before painting the color you want makes it pop. Let each layer of paint dry before applying the next layer. You can find acrylic patio paints prices by clicking here to Amazon. Adding text with markers is easier than painting words. Through trial and error, I have found that Posca Markers work best for rock painting. These markers are your secret weapon to creating beautiful designs easily. You can find them here. Make sure you look at the tip size before purchasing to make sure you have the right size. This Fineline Applicator lets you control your artwork. You can find them here. Dotting tools make perfectly round dots. I love using these and they are really inexpensive you can find them here. This is one of the most important steps to rock painting. All that hard work that you put into your stone would be wasted with any type of moisture. You want a seal that won’t curdle if the stones are subject to the outdoor weather. Here’s the sealant that I recommend. Two thin coats works best. How many have us have been guilty of not cleaning our brushes right away and throwing out a rarely used brush because of it? Soak your paintbrushes in this, and you’ll never have to do that again. Find it here. Now I know you’ve been dying to get a little peek into this beautiful book. It’s a good thing Amazon lets you do just that. Just click on the picture and when you see the book on Amazon go to the top right corner and it will let you look inside. Amazing…right? If you want to read more about the kindness movement, please check out my blog post below. If you want to see if you have a Facebook rock painting organization in your area just put in the Facebook search box your city or county and the word “rocks.” It’s fun to see what your local group has been up to and you’ll be amazed at the talent you will find in your own area. We’ve reached the end of Stone Painting for Kids: Book Review. I hope this post inspires you to pick up a paint brush and encourage your children to do the same.